There are more bridges in the city of Pittsburgh and throughout Allegheny County -- the province of the Pittsburgh District -- than any place in the world. Our bridges provide vital links between the hills and valleys and across the famous rivers where the diverse people of our region live, work, worship, and serve. 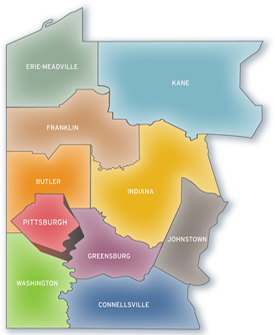 In much the same way the role of the Pittsburgh District office is to provide linkage -- bridging if you will -- between our congregations and communities bringing leadership, resources, connection and transformation within our region as Christ's agent of grace. A current model of ministry includes a variety of cooperative and inter-parish relationships to more faithfully and fully use our gifts to reach God's children with the good news of the grace of Jesus Christ. In that regard, and in mutual supportiveness, the United Methodists of the Pittsburgh District hope to live out our Wesleyan mandate of personal spiritual growth and positive social action and justice. The partnerships and cooperative ministries listed herein will speak of the nature of some of our bridges. You are cordially invited by the superintendent and the 22,599 disciples, 58 congregations, 88 pastors, and 23 extended service agencies of the Pittsburgh District to explore your faith development, to link with us and each other in service, and to make a difference for good in our region and around the world. Life is a precious gift from our God. We pray that our witness as the people of the United Methodist Church within the Pittsburgh District reveals our gratitude for the gift.